After causing a fatal car accident, political superstar Blair Van Howe perpetrates an elaborate cover-up to ensure his political survival. When a dogged detective nears the truth, Blair must ask himself how far he is willing to go to protect his dark secret, and whether the good he can accomplish politically justifies the sins he commits when no one is watching. Read an excerpt. Joe Hayes is an ethics lawyer born and raised in Chicago. A graduate with honors from De Paul University, he obtained his juris doctorate from the University of California at Berkeley. He has practiced law around the country for 18 years and has become a legal expert in ethical law. He is also a member of Mensa and the Society for Corporate Compliance and Ethics. Currently, he resides with his wife Susan and his three children in The Woodlands, Texas. An active philanthropist and is constantly speaking about the power of counseling. 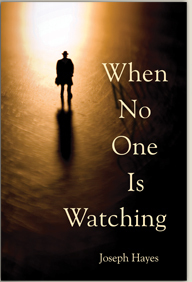 For more information on John Hayes and his novel, When No One is Watching, visit www.joseph-hayes.com and www.whennooneiswatching-thebook.com. If you'd like to win a copy of When No One Is Watching, leave a comment below. If you follow My Book Retreat, leave another comment. If you follow me on Twitter (@MyBookRetreat), leave another comment. This giveaway will end on Tuesday, October 26 at 10:00pm Eastern time. The winner will be chosen by random.org and notified by email, so be sure to include your email address if it's not easily accessible. The book will be sent directly from Phenix & Phenix Literary Publicists. I would love to read When No One Is Watching :) *Thanks* for the giveaway! Sounds good...would love to win.